We start the new season with Pete Coe who is a versatile performer. He sings both contemporary and traditional, dances and plays (sometimes all together) which can leave you breathless but doesn’t seem to bother him! 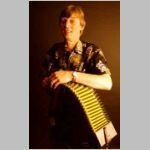 Pete’s own songs have been regarded as modern classics and are performed the length and breadth of the country often by people who think they are singing traditional songs. He is very popular at the club so come early for a seat.